Here is a Money Transfer Form sent from NEMIROV POD[olia] 15 1 19, received at DUNAEVTSI POD 20 1 19 and signed for - but not until 3rd April 1919 (Interestingly, it is signed for using the Ukrainian word for "April" which is "Kviten" (Russian is "Aprel")). 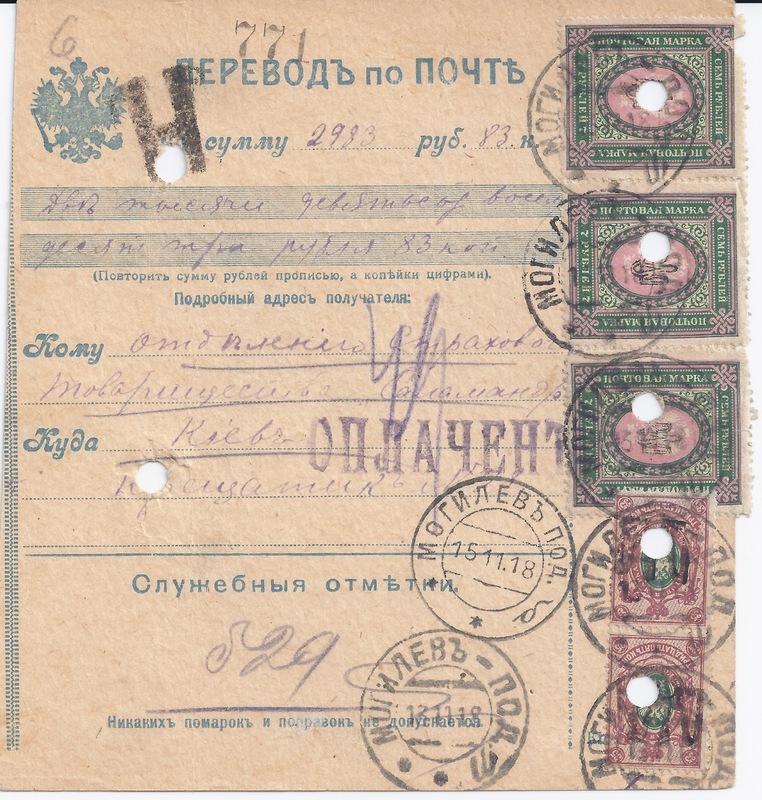 So how did these stamps all end up in Nemirov? (1) Within Ukrainian National Republic - controlled areas, Districts helped other Districts by supplying them with stamps they needed but did not have locally. A simple Telegraphic request could have triggered a shipment. (2) As UNR areas fell to Red or White control, some pro-UNR (postal) officials left and took with them whatever supplies of stamps they could carry and these were put back into circulation in UNR areas (of which Podillia was the longest lived). As a minor variant, when UNR-supporting postmasters saw that their local area was about to be taken over by Red or White forces, they bundled up stamps and sent them on any train departing for a UNR area and, once again, the stamps got put back into circulation. It would be interesting to know what actually happened. 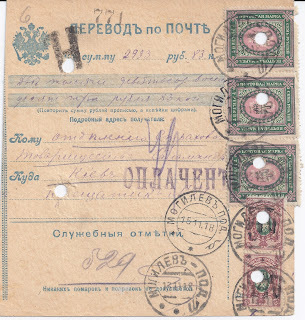 Here's another Podillia Money Transfer Form with a mixed franking of Podillia 8a and Poltava Type 1 Tridents - the latter on the three 7r perforated stamps. 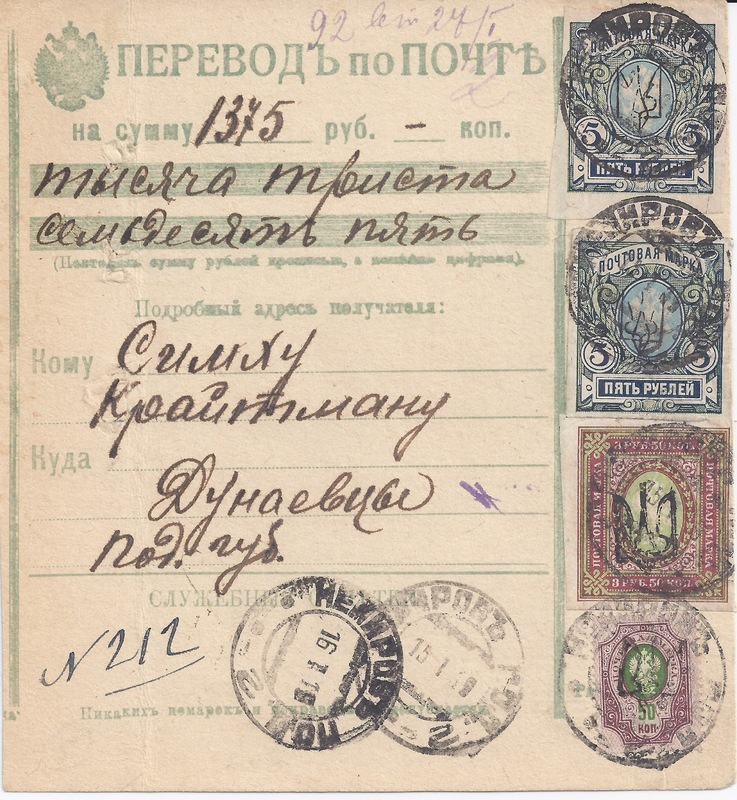 The card was sent from MOGILEV POD 13 11 18 to KYIV (Ukrainian language canceller on reverse).With the stamps on the back (which include unoverprinted Postal Savings Bank stamps) this card is correctly franked at 22 roubles 50 kop equal to a rate of 75 kopecks for each 100 roubles or part thereof transferred.